Did you know that the average PC user types two million keystrokes a year? That’s the equivalent of your fingers running a marathon on your keyboard every year! Because anything that you spend so much time with should be as comfortable (and easy) as possible, my team and I assess all aspects of the keyboard. I love the work I do because typing is something we do every day for hours and hours. And, because the keys are the part of the keyboard you touch the most, we’ve spent a lot of time finding ways to improvements this experience. Here are three keyboards that incorporate a range of innovations related to the typing experience. The Comfort Wave Design has a keyframe that is not flat, but wavy, as the name implies. Your fingers vary in length, and the wave design works with those deviations, comfortably cradling your fingers. The keys you’ll press with your pinky fingers are the highest and those hit by your middle fingers are the shortest, so you don’t need to strain your hands and forearms to type. The design makes typing more natural and fluid since your fingers can work in a more natural position. And, unlike other curved keyboards, our Wave keyboards feature a familiar shape (rather than the split-key shape) and consistently sized keys, so you don’t have to relearn how to type. The Comfort Wave Design can be found on the Cordless Desktop Wave, Cordless Desktop Wave Pro and the Wireless Keyboard K350. According to independent scientific studies done by two U.S. universities, the Logitech Wave Design improves comfort. The PerfectStroke key system was developed from our desire to put the best parts of a laptop’s keyboard into a more comfortable, full sized keyboard to create an unforgettable typing experience that makes every key stroke smooth, comfortable, and quiet. This system uses the scissor-key mechanism found on laptop keyboards for an improved key feeling and faster response time. 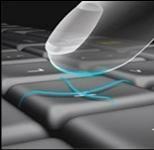 To create this affect, micro-scissors are added under the keys to help control the force and travel of the keystroke. Key travel is the vertical distance required for each keystroke, or how far down the key moves when you press it. Whereas laptops typically have a key travel of 2 to 2.5mm, research shows that a longer key travel improves your typing comfort and requires less force. So, we gave PerfectStroke a key travel of 3.2mm. If, like me, you like the feeling of your laptop’s keyboard, but wish it were more comfortable, you will love our keyboards with PerfectStroke. PerfectStroke technology can be found on the diNovo Edge (both the PC and Mac version), the diNovo Keyboard (PC and Mac versions) series keyboards and the Illuminated keyboard. 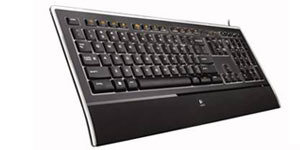 We recently launched a new keyboard in the U.S. called the Wireless Desktop MK700 featuring Incurve keys. This time, we looked at the very design of the surface of the key, called the keycap. All keyboards have a cylindrical concavity to their keycaps, causing a slight rise to the right and left edges, to help you decipher one key from the next. Incurve keys have a spherical concavity that makes all four edges of the keys higher than the center, so the keycaps complement the ergonomic profile of your fingertips and help your fingers to better locate each key, resulting in a better typing experience. We also softly rounded the edges, enabling your fingertips to glide from key to key and making them very aesthetically pleasing. How do I switch from french keyboard to english? If you have a PC, go to “Control Panel” (click on the Windows icon, or Start Menu at the bottom left corner of the screen), open the “Region and Language” link (it may have a different name depending on the Windows version you have), click the “Keyboard and Languages” tab, then click on “Change Keyboard.” In the window that will pop up, you can select multiple country layouts. If you have a Mac, go to “System Preferences” (click on the Apple icon on the top left corner of your screen), click on the “Language & Text” icon, then on the “Input Sources” tab and select the country layout you want to switch to. Very interesting. Thank you, Sylvain. Hope you’re doing well. PerfectStroke and low-profile are great, I think the Illuminated Keyboard is the best Logitech keyboard available, nice Aero-like border, minimalistic, not bloated, low-profile, elegant and with backlit. The only missing thing: it’s not wireless, that’s very annoying. Still, I think you should also explore the “island keys” solution (like the MacBook Pro keyboard) as it is simpler to keep clean. 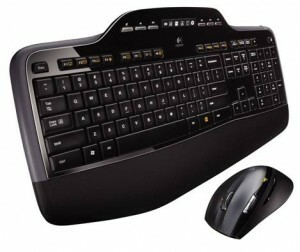 My perfect keyboard would be a ” Logitech Illuminated Keyboard”, wireless and maybe with island keys. (1) It invites you (or give you “feel”) to use a lower force the moment when you exercise to press down the keycap (So, you don’t tend to press hard on the key). When would your build a keyboard that merges all these improvements? Also if you make your keyboard or mouse wireless please go with a standard technology, namely Bluetooth. I don’t want 2.4GHz, “unifying” nor any other kind of adapter; I paid extra for the built-in Bluetooth receiver on my laptop for a reason. I find the Logitech wave very nice to use. I have had it for almost 3 months now. No problems at all. Other wise, for a cheaper option, the Microsoft Comfort Curve 2000 is also excellent. 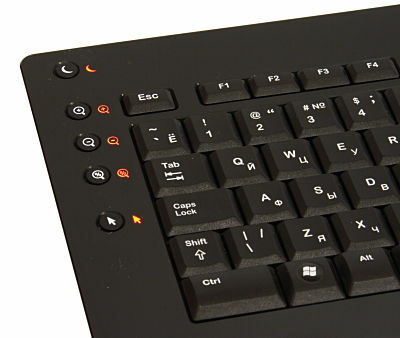 Why exactly Logitech keyboards sold in Russia have this weird small left Shift key (as shown in this picture? It cannot be explained rationally because this whole circumfision serves the sole purpose of placing another backslash key in the freed space. But there is already one backslash key near the Enter! So, a normal left Shift is obviously more important than two identical backslash keys. What do you think?